Before Sam Baron broke Odin's curse on the witches to become the first son born to a witch and the hero of the Legends of Orkney series, his mother was a young witchling growing up in the Tarkana Witch Academy. 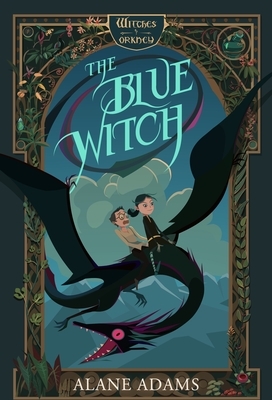 In this first book of the prequel series, the Witches of Orkney, nine-year-old Abigail Tarkana is determined to grow up to be the greatest witch of all, even greater than her evil ancestor Catriona. Unfortunately, she is about to fail Spectacular Spells class because her witch magic hasn't come in yet. Even worse, her nemesis, Endera, is making life miserable by trying to get her kicked out. When her new friend Hugo's life is put in danger by a stampeding sneevil, a desperate Abigail manages to call up her magic―only to find out it's unlike any other witchling's at the Tarkana Witch Academy As mysteries deepen around her magic and just who her true parents are, Abigail becomes trapped in a race against time to undo one of her spells before she is kicked out of the coven forever Rich in Norse mythology, The Blue Witch is the first of a fast-paced young reader series filled with magical spells, mysterious beasts, and witch-hungry spiders.